Here at WrestlingDVDNews.com we had the opportunity to view an advance copy of the latest WWE DVD release – War Games: WCW’s Most Notorious Matches. This 3 disc DVD and 2 disc Blu-ray set has been eagerly awaited by fans for many, many years and based upon the quality of the matches alone this set delivers. It’s comprised of all NWA/WCW War Games matches which exist within WWE’s video library, and the Blu-ray even includes versions of the match from Smoky Mountain Wrestling and ECW. 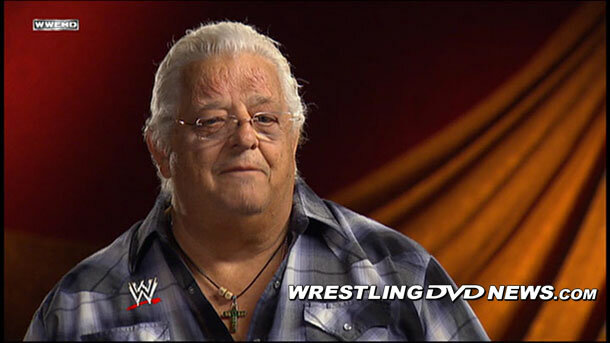 The set is hosted by the man who created the match way back in 1987 – “The American Dream” Dusty Rhodes. During the initial chapter Dusty recalls a story of his inspiration for the match as well as discussing the physical creation of the cage by veteran wrestler turned JCP/WCW backstage assistant Klondike Bill. Unfortunately the quality of the first two matches isn’t exactly “HD” (and this could be the reason we haven’t seen either match released before now) but it is very watch-able, especially given the historic significance of the matches. Unfortunately WWE has removed Jesse Ventura’s commentary from the 1992 & 1993 matches and the 1988 match does not include commentary (similar to how it appeared on Ric Flair and The Four Horsemen). No need to discuss each match in detail here, as Joe Israel will be providing an in-depth review very soon. It’s worth noting that Dusty’s segments between matches provide an insight into the wrestling world and WCW at the time; unfortunately he doesn’t provide any real background to the matches and the feuds going into them. This could have made the set a little better, as all the matches had a build to them (remember: The Marietta Massacre, Masters of the Power Bomb, nWo vs. WCW and The Dungeon of Doom?). All in all, War Games: WCW’s Most Notorious Matches is a very good watch and matches range from very enjoyable to awesome. If you are a fan of WCW or NWA I’m sure you are already counting down the days until next Tuesday, but if you aren’t a huge WCW/NWA fan this set will not disappoint. Check out some exclusive screenshots and video previews below. WWE will release War Games: WCW’s Most Notorious Matches next Tuesday on DVD and Blu-ray formats. It follows on to UK/Europe and Australia next month. Click here to get your copy at Amazon US. Click here to get your copy at WWEDVD UK. Whats odd is that WWE had a War Games theme on Classics on Demand few years back and both 1992 and 1993 had Jesse Ventura’s commentary. I’m curious why the 1988 Bash match doesn’t have commentary. It was shown live on PPV. Very strange. The Tower of Doom match from the 1988 Great American Bash does have commentary, as that was part of the PPV. The War Games match was part of the Tour and they must have never recorded a commentary track for it. Similarly the unreleased Ultimate Jeopardy Match from ECW December to Dismember 1995 on the Blu-ray also doesn’t have any commentary. If the first two War Games matches are only “very watch-able,” what exactly are we supposed to call that atrocity of a YouTube download (at least a couple of VHS generations old, not to mention a PAL convert) they released earlier this year? Or, how about the Georgia match on the same set that was clearly A VHS copy from a VHS TV recording. At very least the two War Games matches in question will look as good as an SP VHS Turner master if not noticeably better. pre-ordered my blu-ray today. Cant even wait! Finally! A match that has Chris Benoit! s going to review 9 hours of WAR GAMES? Uggghhhh…. Will these discs even keep Joe’s interest being that most of the matches took place before he started viewing pro wrasslin’? Bring on the review!!! I’ve read other reviews of that DVD/Blu-Ray online since I wrote mine, and I’m not alone at all in finding the Final Four match very overbooked. Why does Joe Israel get such a bad reputation on this site? His reviews aren’t awful and if you (whoever you are) think they’re bad what does it do for you either way? If Joe does a good or bad job reviewing that really doesn’t influence my decision to or not to buy either way. I collect WWE sets and it doesn’t matter to me if Joe gives a “good” or “bad” review one way or another. What is this bad reputation you speak of though? His reviews are generally very well received in views and comments that I see. I think you’re addressing a small minority that can’t get past his age and how many years viewing the sport. I started out as a WCW fan growing up and I currently own every WCW-related DVD set that WWE has released so far…the War Games is one of if not my personal favorite steel cage-style match in wrestling and to finally see the evolution of this extraordinary match is gonna be fun!!! I can’t wait for this set to come out on DVD!! !